Our rooms are adorned with beautiful antiques, and paintings by well known local artists. The lawns and gardens are manicured and flower beds mark the walk ways. The large wrap around porch can be enjoyed on those hot summer evenings and the beautiful hand crafted fireplace for those cool fall and winter evenings. 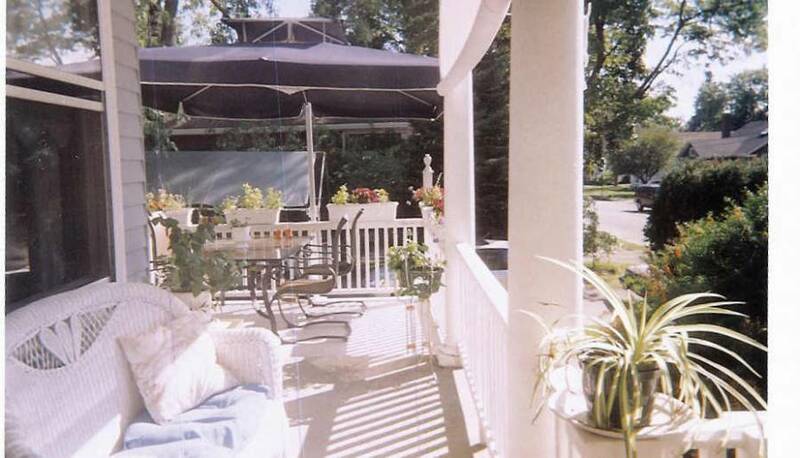 Let us make your stay in Portland unforgettable and pleasant at our charming, comfortable b & b, located in the quiet Rosemont Area , only minutes from all acitvities in this historical city. We always try to be enviromentally conscience. We reuse when we can, recycle as much as possible and reduce consumption of unnecessary materials. We collect rain water to water our flowers and vegetables. Real glasses and cloth napkins beautify our breakfast table as well as making it less wasteful. 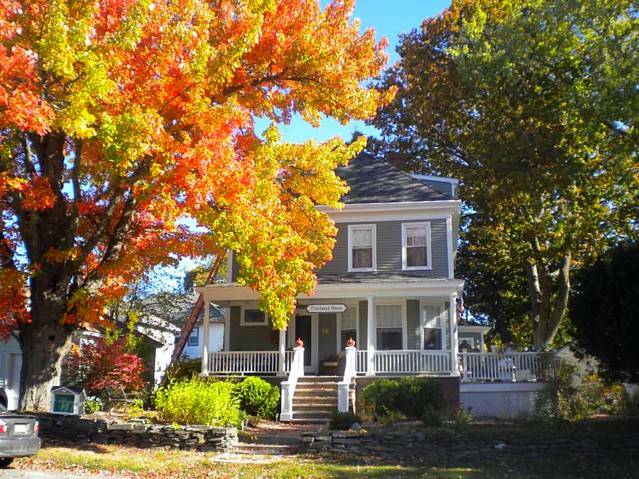 This old house was constructed in 1890 and has lived a wonderful life and expects to live a lot more. 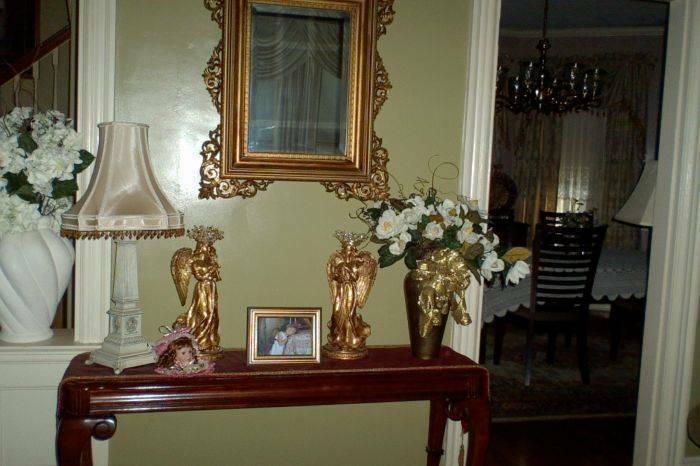 It has good bones and has had the good fortune to have had fine people that have cared for it thru the years, getting a face lift now and than. It has all new windows, doors, pillars and railings, the list goes on and on. The first family that dwelled within was a minister, his wife and children. This was the parsonage for the church across the street. Next came Dr. Mc Donald, his wife and their 10 children. This was the doctors practice, as well as his residence. In 1959, a contractor, Ottaviano, Dave to his friends, his wife Camilla, Peggy to hers, and their 5 children lived here. 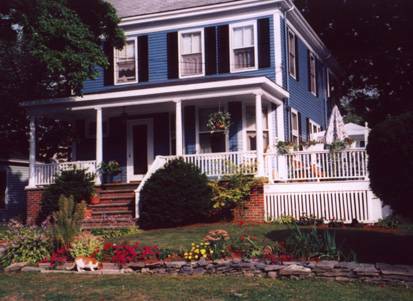 After Peggy and Dave, passed away their daughter, Linda came home and she and Jim, opened this B&B. The families that have lived here were hardworking and a joy to be a part of. Many children have grown up here and moved on. The occasions that have been held in these walls, have been memories born of happiness and sorrow. 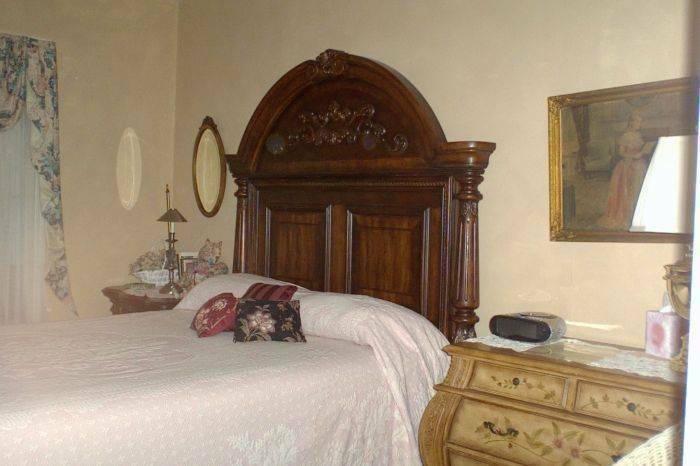 The Edith Ann Room features a cherry queen four poster rice bed, an antique tall boy, a cherry wood secretary, and features paintings done by well know local artists. This room has three large windows for a light airy feeling. The Bay Room has a queen antique wooden bed, private bath, three large bay windows, beautiful paintings by a well known local artists, and overlooks the side gardens. The Anthony David Room has an antique mahogany bed, Bombay chest of draws and comfortable valvet chair. Paintings are done by a well known local artist. 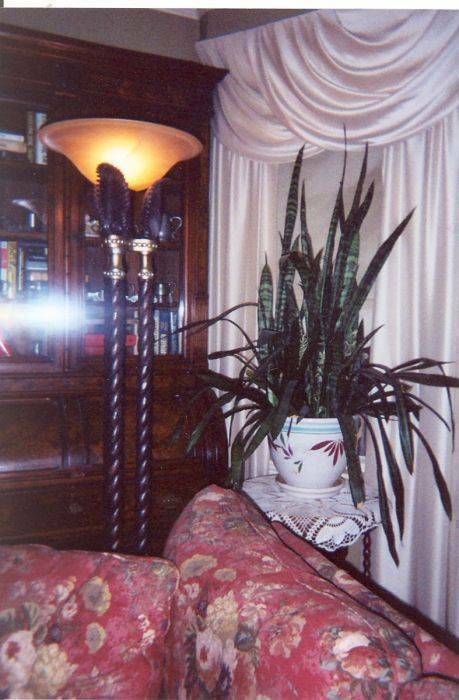 This room over looks the east side and side porch. The Edith Ann Room and the Blue Room ( share a bath) The Anthony David Room does not have a TV, but guests are welcome to watch the 48' TV in the living room. We have resident CATS, Lucy, Little Pickles and Oliver. They are friendly and love greeting our guests. Our B & B is in the quiet subburbs of the Rosemont area in the city. Spring, summer and fall the Fleetwood House is adorned by beautiful lush gardens, with hundreds of flowers in every different color imagineable. 25 % non-refunded deposit is required. Guests are responsible for the entire length of their stay. No refunds are given for failure to arrive on the initial date of your reservation or if departure occurs prior to the last date of your reservation. Cancellations are accepted one week in advance. 9% State Sales Tax is exclude and will be charge at time of check out.